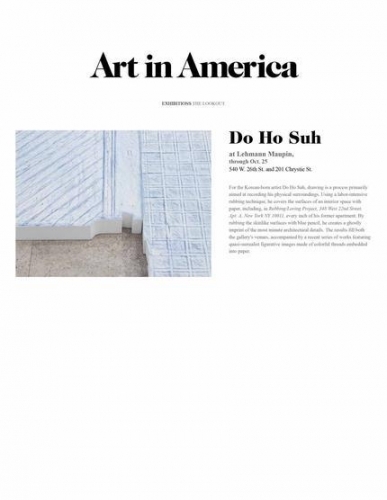 For the Korean-born artist Do Ho Suh, drawing is a process primarily aimed at recording his physical surroundings. Using a labor-intensive rubbing technique, he covers the surfaces of an interior space with paper, including, in Rubbing/Loving Project, 348 West 22nd Street, Apt. A, New York NY 10011, every inch of his former apartment. By rubbing the skinlike surfaces with blue pencil, he creates a ghostly imprint of the most minute architectural details. The results fill both the gallery's venues, accompanied by a recent series of works featuring quasi-surrealist figurative images made of colorful threads embedded into paper.